Adelynn is fascinated with wind chimes. This fascination may have to do with my fondness of them too. My first wind chime was bought second hand in a thrift store in Western Colorado. I proudly hung it on the side of my little cottage where its lovely little song would dance in the wind. There it stayed until I needed to pack it up and take it with me to DC. Last summer that small delicate wind chime finally broke. A disappointing clunk was its last song. The string and wood disk after being exposed to the outdoors for 14 years fell apart. It was sad seeing the pile of string and chimes on the ground. Since that first wind chime several others have come to our home. Our second was a significant one as it was a wedding gift from a dear friend. For 12 years it has faithfully swayed in the wind. I call it our wedding bells. They currently hang in our herb garden in a more protected location. About the others. I have one set that was given as a birthday present. This chime had been the one to stir Adelynn's interest. She happily banged it as it hung on the basement door knob. From there I learned to find ways to let her explore the sounds of wind chimes. 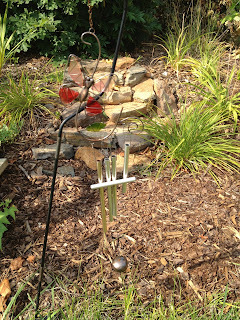 Three more chimes and a bell later our yard is full of wind influenced music. The largest chime is up high only for a jiggle when in Mom or Dad's arms. Addie never misses a chance to persuade us to let her give that clapper a push. With an eager toddler seeking wind chimes to hit I thought is was time to have some placed where she can comfortably reach them on her own. 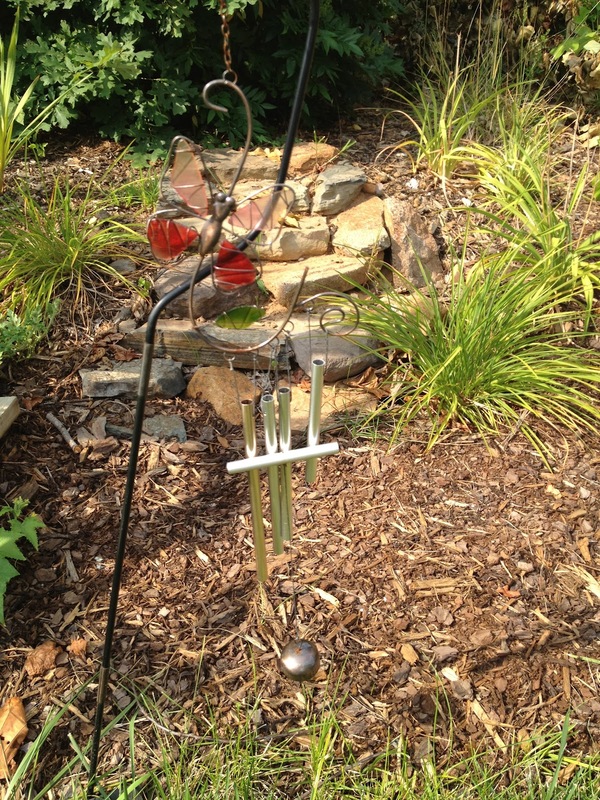 We found 2 small chimes perfect for Adelynn to play with while outside. One has been hung next to the vegetable garden in an easy to reach location. She heads straight for them every time we go outside. It is so funny to watch her shake those chimes. Her sly grin tells me that she still thinks that she isn't supposed to be playing with them. 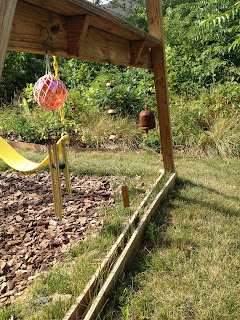 To keep her interest in making music we created a spot to hang more chimes and a bell. This is one noisy spot. Not only is it an attraction for Adelynn it seems to hold the interest of many other children. I have to admit I too am known to give those chimes a good whack. There is something so joyful in hearing the music made by wind chimes.